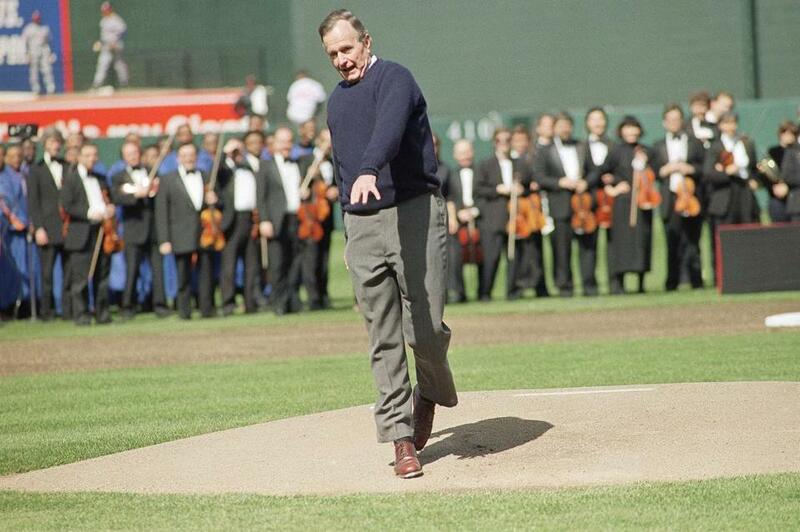 In this 1992 file photo, George H.W. Bush reacts after throwing the ceremonial first pitch to Baltimore Orioles catcher Chris Hoiles to open Oriole Park at Camden Yards. Those who make it to the top of the political world are highly competitive souls. They are often polite and courteous, but invariably they play to win. George H.W. Bush was no exception. We met 43 years ago on the White House tennis court. I had received a call from President Gerald Ford’s personal aide that Saturday morning to see if I was available to play tennis at 1:00 p.m. As a former collegiate tennis player with young, fresh legs, I was someone the president enjoyed having on his side on the court. I inquired whom we were playing and was informed that George Bush was now back from China and going up early the next week for his confirmation hearings as CIA director. The president knew how much his friend enjoyed playing tennis and had invited him to a match on the White House court. George Bush was a good tennis player. He and his frequent doubles partner Jim Baker had won some club tournaments in Houston. The match was fun but intense. More than once the president instructed me: “Get this point.” One of the things you quickly notice in such contests is how players call the lines. Some of the most competitive players give themselves the benefit of the doubt. George Bush was among those who followed the adage: If in doubt, call it in. In playing with him scores of times over the next several decades I never had occasion to question a line call. This was a man who was intensely competitive but scrupulously honest. We served together for five years in the Reagan White House and then another four years during his presidency. Some who successfully climb the ladder of higher and higher elective office are changed by the experience. George Bush remained steady and largely unaffected by his electoral success. He had a constancy of character that was both striking and inspiring. As a young man, George H.W. Bush was not merely an outstanding scholar (Phi Beta Kappa at Yale) but also a gifted athlete. In acknowledgment of his athletic accomplishments, during his presidency Sports Illustrated decided to do a cover story on his athletic career and interests. I had the assignment to meet with him before the interview to help him prepare. I was aware that he had played varsity baseball at Yale, as first baseman, and was captain of the team. I began by inquiring about his baseball career and asked if the Yale team was good. He responded matter-of-factly, “Yes.” I asked if they had beaten Harvard. His face broke into a smile and he answered, “Yes.” Did you win the Ivy League? “Yes.” Did you play in the NCAA tournament? He responded positively. I then learned that in the late 1940s, the NCAA baseball championship pitted the team that won a tournament involving universities east of the Mississippi River against the team that won a tournament involving universities west of the Mississippi. During his last two years in college, the Yale baseball team played both years in the NCAA championship game — losing to the University of California (Berkeley), 8-7, in 1947 and to the University of Southern California by a score of 9-2 in 1948. Needless to say, I was impressed. This was a remarkable accomplishment of which I suspected most were unaware. Then, without expecting more, I asked if he played any other sports in college. He responded, “Yes.” I eventually extracted that he had started on the varsity soccer team as a freshman, that Yale had not merely won the Ivy League, but made it to the national championship game. I was stunned. I thought I knew him well. Why was this interesting series of accomplishments so little known? Admittedly, many years had passed. Still, in a time when those running for public office often buff up their resumes, George H.W. Bush was intensely modest. He often seemed uncomfortable claiming credit for successes or talking about himself. His reticence stemmed in part from an experience he had as a teenager. A gifted young athlete, he had played particularly well in a soccer game and returning home burst through the door calling out, “Mom, Mom, guess what, I scored three goals today.” His mother’s response was immediate and penetrating: “George, how did the team do?” It was a question that he never forgot and that he consistently answered throughout his life in a way that his mother would approve. For George Bush, his team was his family and his country. Both those teams realize anew with his passing how fortunate they were to have his calm, quiet, and confident leadership. Roger B. Porter, IBM professor of business and government at Harvard University, served as assistant to the president for economic and domestic policy from 1989 to 1993.